simply yin: Happy Mothers' Day! To every mom out there, a Blessed day to you to celebrate that which has changed us forever, make us worriers for life, yet brings us the greatest joy and fulfillment! Been a while since the last post. I had been busy with work, and also these few weeks with the boys preparing for their mid year exams. You must read a lot about us studying for exams. Education is a big thing in Singapore, as in most Asian countries, for various reasons, whether right or wrong, good or bad, we are very affected by it. The boys spend a lot of time on homework, projects, and exams, we try our best to support them through it, and expand their life in as many other ways as we can. If you are interested to find out more, the best place is at my friend Monica's blog, Of Kids and Education, she shares with wit and honesty, finds the beauty, fun, and christian perspective in bringing up kids in Singapore. We love her and her blog. And you should read her post today on Mother's Day! 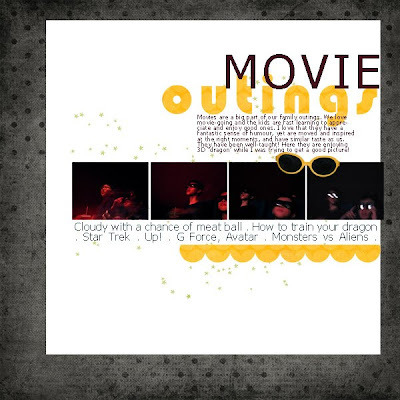 Scrapping-wise, I had been playing catch up on ''everyday" layouts and moments & thoughts I want to capture. Am re-visiting the clean and linear style I used for 365, another style I enjoy and also because I can do 3 layouts in one night!! Will probably start on the travel layouts again soon. (I have the entire Hokkaido trip to scrap!) And here's 8 layouts I did this week! Do you, do you too? Finally I scanned this and preserved it for my scrapbook for all time! And of the movie outings we have been having, took a big risk and took these photos (many of them, actually!) in the dark cinema, to catch them in those 3D specs! 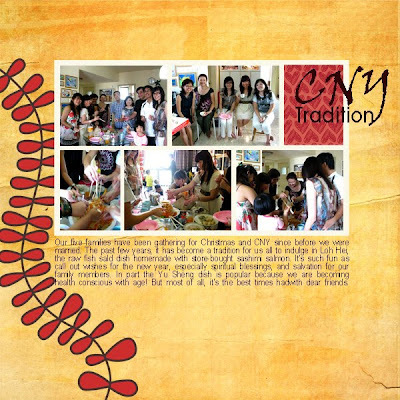 A Chinese New Year layout - and our almost a tradition Loh Hei (Yu Sheng) - a homemade 'raw fish' salad where everyone joins in to 'mix' it, lifting it high up with chopsticks while declaring 'blessings'! And here's me and dh on our weekly date nights - a big part of our lives that I must not leave out of our scrapbooks! Have turned these 10 layouts into an album template set for you in the store with papers and brads included, so you can make a quick album if you like. A very happy Mother's day to you from Canada! 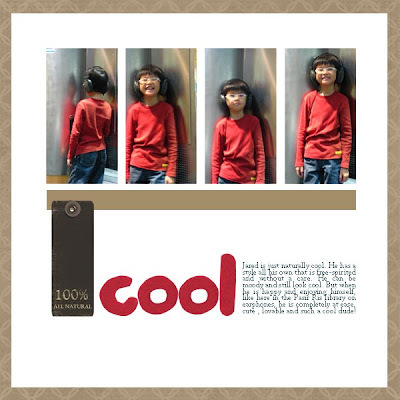 Thank you for the freebie and the inspiration in both your text and layouts! Hi Yin! Thank you for the new template! I love your linear style layouts with the little paper style touches. :) Happy Mother's Day to you! Happy Mothers Day to you! I so enjoy reading about you and your family. Happy Mothers day and thanks for the template! Love your layouts! Th♥nk you so much. Happy mother's day to you! Oh, I want to be you when I grow up! I LOVE your layouts. 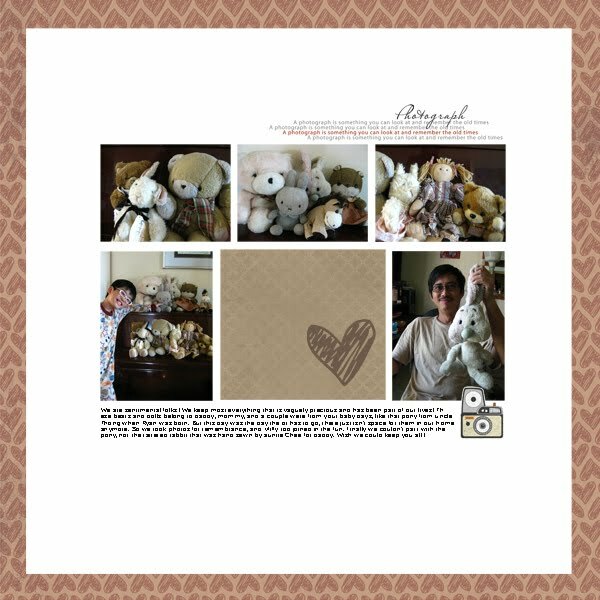 Thank you for the new template; do you mind terribly if I start to scraplift, too??? Thanks for sharing your life and talents with us readers. 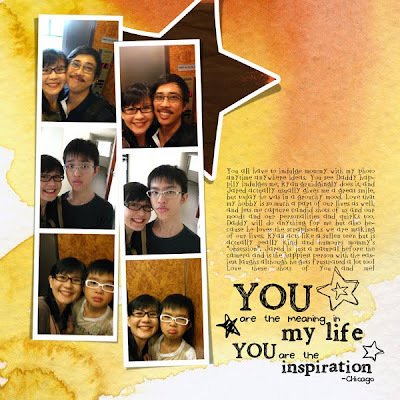 I love reading about your family adventures and really appreciate the templates you share. Thanks a lot for your templates! I always like them!! I wanted to thank you for your beautiful templates! They are so great because most templates are for only one photo. I love that you can put so many pictures in a layout! :) Thanks again! I love all the new stuff!! The linear style really suits your pages, but then your framed ones always come out nice and clean/simple too, you are such a great scrapper :) Thanks for sharing, Yin!!! 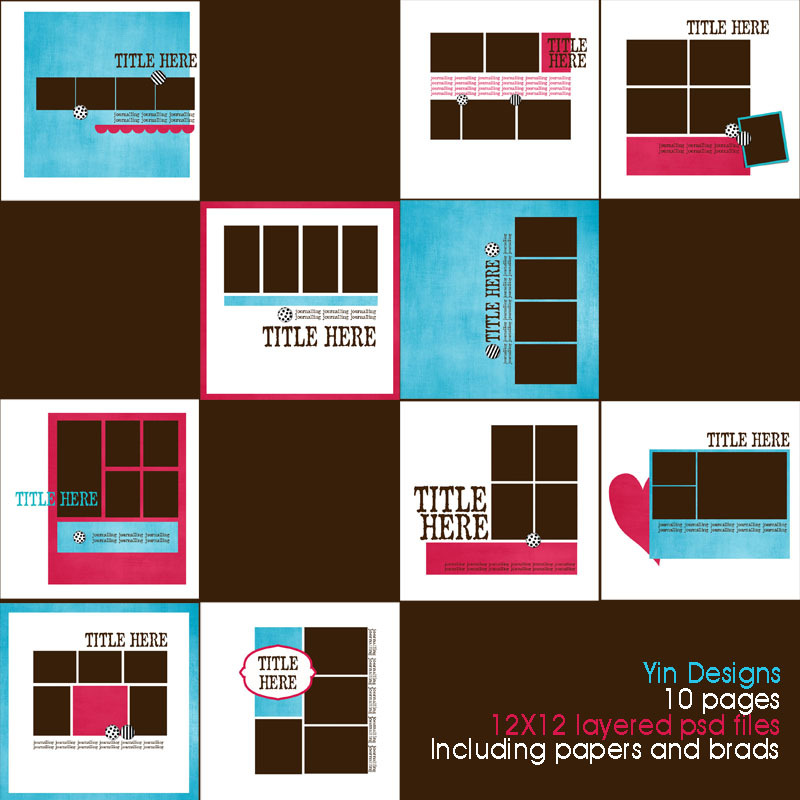 Your templates are such an awesome source - as well as your ideas on layouts. I love to see them everytime I visit! And so this is why I chose you to be one of those to recieve my passed on "Honest Scrap"-Award. Thanks for your designs and freebies! Now it is your turn to tell us 10 things about you and pass your award onwards to 9 other sites. Have a lot of fun! I hope you had a wonderful Mother's Day! Thank you for the awesome star template! Thank you for sharing another lovely template Yin. 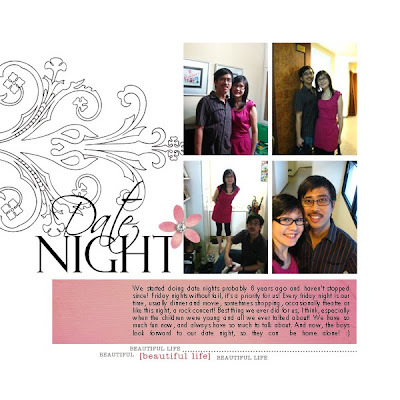 I HEART your 'date night' layout! That is a fantastic idea too lol. I love looking at your beautiful layouts of you and your family. It gives me inspiration to work on my own. Your templates are a great help too! TFS!!! Thank you for this lovely template. I love doing layouts with lots of photo's. Have been doing my Mom & Sisters trip to Germany. Very Fun. 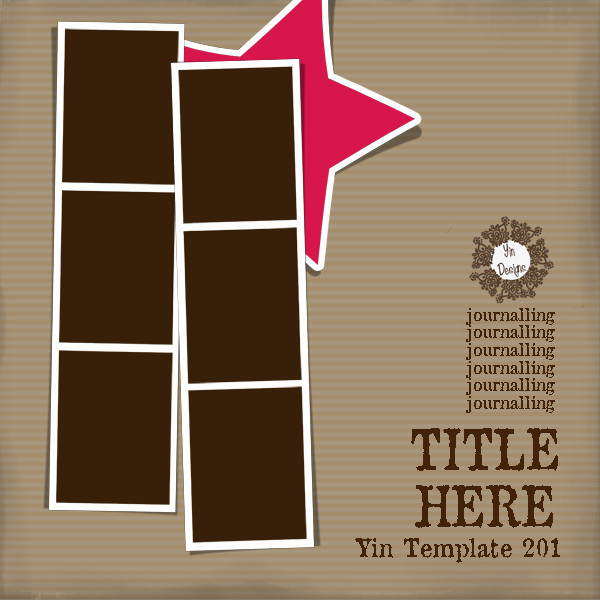 Dear Yin, thank you so much for your wonderful templates, I love working with them, have a few downloaded and a few bought and love making albums with them. Super cute! I love the star! Thanks so much! Another great one! Wonderful template! Thank you so much for sharing it! I'm wife, mom, and addicted to creating art and life story telling through digiscrapping. How I Project Life-d On a Trip! What do our scrapbooks tell about us?